Now that the summer holidays have arrived, every parent is on the lookout for ways to keep the kids occupied. While us mums love having our little ones home with us, it can be a bit of a struggle keeping them entertained for six weeks. However, that being said, it is possible, it just takes a bit of creative thinking that’s all. As well as having days at home baking, getting crafty and watching movies, it’s important that you also plan a few fun days out. Kids love the beach, so if the sun is shining, why not pack up the car and head to the beach? Beaches are great fun and have so much to do that the kids will never be bored. From building sand castles and swimming in the sea to having donkey rides and watching Punch and Judy, there’s always lots to do. One of the best things about taking a trip to the beach is that it isn’t an expensive day out. All you need to pay for is the fuel to get there, the parking, and your picnic food, and that’s it. So, even if money is tight, a trip to the beach is the perfect family day out. For us mums, theme parks may not be the most exciting of places. 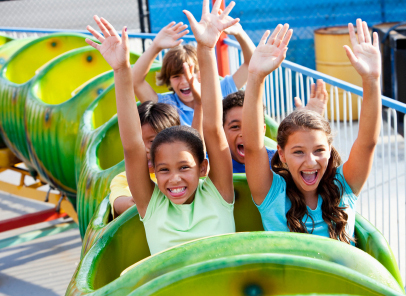 However, kids absolutely love going to theme parks, so they are the perfect place for a family day out. The best thing about taking the kids for a day trip to a theme park is that there are so many to choose from. From Thorpe Park and Alton Towers to Blackpool Pleasure Beach and Drayton Manor, there are lots of options. So, however old your children are, there will be a theme park that is perfect for them. Around the UK, there are various off-road cycle paths that are ideal for a family bike ride. So, if the weather is warm, pack up a picnic basket and head out for a family day of cycling. Just make sure to map your route in advance to ensure that you have chosen a route that is completely off the roads, so it is safe for your little ones. To find the best local cycling routes for families in your area, have a look online and do some research. Many of the UK’s water parks are only open seasonally, so make sure to make the most of them by planning a day out to your closest park. If your kids are young, it’s best to opt for a park that has heated water so that they don’t get chilly while splashing about. Most water parks have various slides and play areas, including areas for teens and adults, children, and babies and toddlers. So no matter how old your children are, the whole family should have a great time. Keeping the kids occupied during the summer holidays isn’t always easy. However, by planning a few fun days out, you can make it much easier for yourself.